U.S. voters are torn between change and experience in 2008? They are demanding something new, but there is comfort in the tried and true. The American public's low opinion of Washington and growing concern about the direction of the country point to 2008 being a "change" election, one like the campaigns of 1974 and 1992 when people looked for a marked departure from the status quo. "I think they're looking for change - serious change, substantive change - and I think they will have to feel like whoever the candidate is is prepared to be president of the United States," Edwards said in an interview. "I will say I don't think they will judge that based on a resume. I think that's a judgment they will make based on what they see and hear - the demeanor, personal strength (and) those kinds of things." Edwards was quick to add that last part because he is more of a "change" candidate than one of experience. Despite this being his second national election, the former North Carolina trial lawyer has little in the way of a political resume outside a single term in the Senate. Obama's inexperience showed at an issues forum in Nevada when he had no answer for the nation's health care crisis. He looked worse at a debate when the Democratic candidates were asked how they would respond to another terrorist attack in the United States. Obama should have been ready for that question. But all he could muster were a few halting sentences about effective disaster relief effort and "good intelligence." 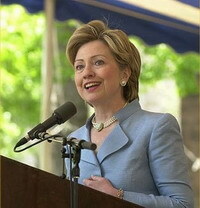 Democratic Sen. Hillary Rodham Clinton of New York pounced on his failure to consider a military action. "I believe we should quickly respond," Clinton said. A USA Today-Gallup Poll this month showed Clinton leading Obama among Democrats nationwide. The No. 1 reason Clinton's backers gave for their support was her experience. The main reason Obama's supporters backed him was "fresh face/has news ideas." Clinton, 59, tries to be what Bill Clinton has called a "change agent." She denounces politics as usual, sponsors an edgy Internet contest and borrows phrases from Obama. "People are anxious to turn the page" and "change the direction of the country," she said this month. Obama, 45, has started giving policy speeches. His wife addresses the not-ready-for-prime-time murmurs. "He has great experience," Michelle Obama told ABC this month. "He's been in the state Legislature. He's been a community organizer. He's been a civil rights attorney. ... Need I go on?" Campaigning in New Hampshire, she said, "I know experience is important, right? But experience without the sort of moral compass is not enough." Republican Sen. John McCain was a self-styled reformer during his failed 2000 presidential campaign. His message this year is less about change than it is about courting conservatives - the Republican status quo. McCain, 70, considers his age and experience an attribute. "I'm older than dirt and have more scars than Frankenstein," he likes to say. "But I've learned a few things along the way."